Scheveningen: Sport Field Quick Den Haag, 6.8 mi. Scheveningen: Hart Beach , 7.6 mi. Scheveningen: Livesteam Beach, 7.9 mi. 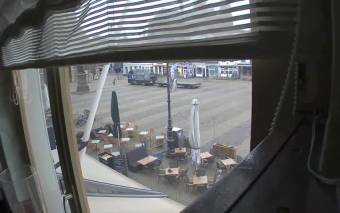 Scheveningen: Webcam Zeezicht, 7.9 mi. 's-Gravenzande: Weathercam 's-Gravenzande, 8.6 mi. Rotterdam: HAL4 on the Maas, 9.4 mi. Rotterdam: Rotterdam De Esch, 10 mi. Hoek van Holland: Beach View, 10.2 mi. This webcam Delft with the theme City Views was added on April 27, 2011 and is operated by Thijl Klerkx. It got 15941 visitors since then. Shouldn't this webcam work or should the link be wrong please report that here. You can add this webcam here to myCams.